It’s no secret that tobacco is dangerous to health, regardless of how you smoke it. There are no safe substances in any tobacco products (from acetone and tar to nicotine and carbon monoxide) and when these ingredients burn, they generate more than 7,000 chemicals, according to the American Lung Association; at least 69 of those chemicals are linked to cancer. Smoking not only affects your lungs but has an impact on your entire body. While smoking can increase your risk of a variety of life-threatening problems over many years (i.e. heart disease, cancer and infertility), some of the bodily effects are immediate, including mood stimulation, anxiety and irritability, unhealthy teeth and loss of appetite (Pietrangelo and Cherney, HealthLine). Feeling worried? Stop right there because the good news is that quitting smoking is certainly possible and can reverse many effects on the body. Below is timeline that explains the short and long term benefits of letting go of that last cigarette. 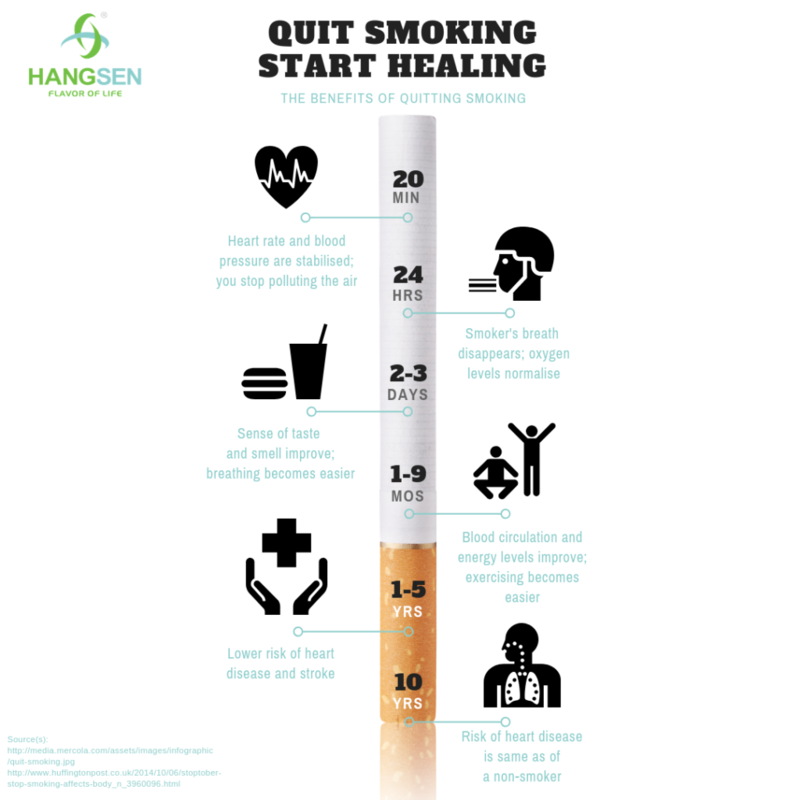 @HangsenGlobal condemns smoking and offers solutions to quit cigarettes for a better quality of life. Ready to hop onto the ‘NO-SMOKING’ bandwagon? If you want to stop smoking, there are various treatments that are available from pharmacies and on prescription to help you beat your addiction to the curb and reduce withdrawal symptoms that accompany the smoking cessation process (NHS England). Nicotine Replacement Therapy (NRT) – a medication that provides you with a low level of nicotine, without the poisonous chemicals present in tobacco smoke. NRT is available as skin patches, chewing gum, tablets, oral strips and more. Varenicline (Champix) – a medication that works in 2 ways: by reducing cravings for nicotine like NRT, but it also blocks the reinforcing effects of smoking. This medication is available on prescription only. E-cigarettes – an electronic device that delivers nicotine in the form of vapour. This enables you to inhale the nicotine without most of the harmful effects of smoking since the vapour contains no tar or carbon monoxide. According to the NHS, research indicates that e-cigarettes can help you give up smoking, so you may want to try them rather than the medications listed above. As with other approaches, they’re most effective if used with support from an NHS stop smoking service. E-cigs are available in many shops and online, for example at https://ivapeiq.eu/# . To all smokers reading this – it’s time to step out to your local pharmacy and set up an appointment with your favourite GP, to finally break the habit and make the switch (just in time for the ‘New Year, New You’ phenomena). I was diagnosed of Chronic Obstructive Pulmonary Disease (COPD) in 2012 at the age of 63. I had been a heavy smoker, my symptoms started out with dry cough and shortness of breath, i ended up in the hospital, on a ventilator. I should have known it was coming, but like most smokers, thought it would never happen to me. My COPD got significantly worse and unbearable because of my difficulty catching breath. Last year, i started on a natural COPD Herbal therapy from Organic Herbal Clinic, i read a lot of positive reviews from patients who used the treatment and i immediately started on it. I had great relief with this herbal treatment. I breath very much better now, no case of shortness of breath or chest tightness since treatment. my doctor has given me Seebri Breezhaler, it’s an inhalation powder 44 micrograms. I take it once a day in the morning. It never helped my breathing condition positively. Presently I am taking BEST HEALTH HERBAL CENTRE COPD HERBAL FORMULA TREATMENT. I take it twice daily morning and evening. It’s a great help to breathing, it’s a powerful herbal formula, 10 out of 10 from me! I had COPD for 9 years. My first symptoms were dry cough, chest tightness and shortness of breath. My first chest x-ray only showed bronchitis. Finally I went to a pulmonologist and was diagnosed with COPD.i have used all the medication yet they don’t work, last year December I was told by a formal emphysema patient to use Total Cure Herbs Foundation herbal treatment which I really did,i was surprise the herbal products effectively get rid of my COPD totally. When you get where you cannot breathe it may be too late. Good luck to each and every one that will be trying their herbal treatment .